Belstaff, the modern British heritage brand, today announces the partnership with The BLOODHOUND Project in celebration of the car, BLOODHOUND SSC, making its first public debut at 200mph at Cornwall Airport, Newquay. This is ahead of a new World Land Speed Record campaign which will see the team aim firstly to break the current record of 763.035mph and then 1000mph, following developments of the car, which will take place on a specially cleared track at Hakskeen Pan, Northern Cape, South Africa. 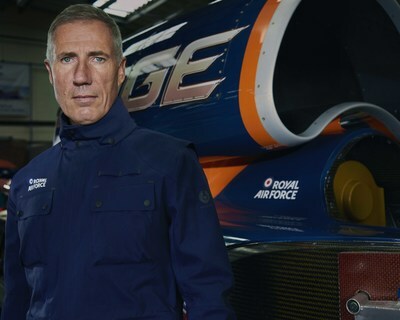 Driving BLOODHOUND SSC will be the current Land Speed Record Holder, Andy Green. In October 1997 former Wing Commander Andy Green and the Thrust SSC team broke the sound barrier, averaging 763.035mph to set a world record, which still stands today. Thrust Project Director Richard Noble and Green then went on to form the BLOODHOUND SSC team, pushing the boundaries of computer modelling, material science and engineering technology. Belstaff has a 93year history with man and machine with previous connections to land speed racing. On September 25, 1924, Malcolm Campbell set a world land speed record of 146.16 mph (235.22 km/h) at Pendine Sands, Wales, in a 350HP Subeam car, ‘Blue Bird’. The Belstaff brand was born the same year and Campbell became a devotee, selecting Belstaff motorcycle jackets known for their functionally and performance. 2016 also saw Belstaff partner with Triumph Motorcycles on the motorcycle Land Speed Record, working with speed record holder Guy Martin on the legendary salt flats of Bonneville. To celebrate the partnership Belstaff launches the limited edition Bloodhound jacket. The four pocket jacket style shows the evolution of this Belstaff signature silhouette and is the first iteration of the ‘Origins’ collection, which will launch in 2018. The material is unique to Belstaff with functionally at its core, including bi stretch, water resistant, wind proof, moisture wicking and UV protective properties. This jacket is designed for movement, available in ‘Bloodhound Blue’, with a tilted left chest pocket, reflective details, high stand collar, rubberised hardware, smartphone friendly pocket and concealed orange hood for protection from the elements. A certificate of authenticity signed by Andy Green is given with every purchase. During November the jacket will also be available from the Virgin Atlantic Club House at Heathrow Airport, with delivery to hotels or homes available to clients. Belstaff has also worked with the BLOODHOUND team and Andy Green to launch a unique pair of sunglasses, designed for use in the African desert during the record attempts. Produced with eyewear licence partner IMATTA and uniquely developed with a double mould injection process, giving the frame their signature BLOODHOUND blue and orange hues. The frame has been constructed using EMS TR90 polyamide making the glasses extremely lightweight and durable. The lenses have been cut from next generation technology providing superior visual acuity and impact resistance. All aspects of working in the harsh conditions of the desert were taken into consideration during the design and construction.